The Antelope Tent is a great tent for children. 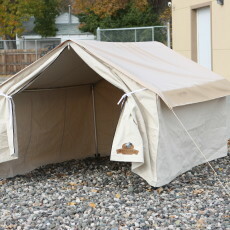 It is a smaller model of our wall tent. It has a zippered front door, window in the back, comes with a frame, stakes and ropes. The dimensions are 6′ wide x 9′ deep x 39″ wall height.